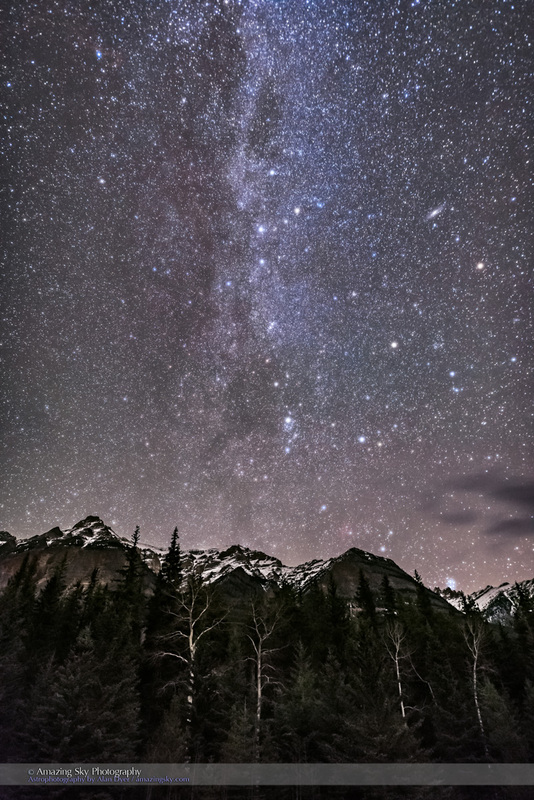 The annual Dark Sky Festival in Jasper National Park ended with the best finale – dark skies, on a beautiful star-filled night. On Saturday night, October 22, I left the final set of science talks in the Big Tent at the heart of the Festival and headed out down the Icefields Parkway for a night of shooting Jasper by starlight. The lead image is of the winter stars, including the Pleiades, rising above Mt. Kerkeslin at Athabasca Falls. The Pleiades star cluster and the other stars of Taurus rising above Mount Kerkeslin at Athabasca Falls, in Jasper National Park, Alberta, October 22, 2016. The sky is brightening with the rising waning Moon off frame at left. Some cloud adds star glows and hazy patches to the sky. This is a stack of 15 exposures, mean combined to smooth noise, for the ground and one exposure for the sky. All are 25 seconds at f/2 with the Sigma 20mm Art lens and Nikon D750 at ISO 6400. I shot the image above moments later, from the usual viewpoint overlooking the Falls, reduced to a trickle in late autumn. Illumination is solely by starlight – no artificial and glaring light painting here. 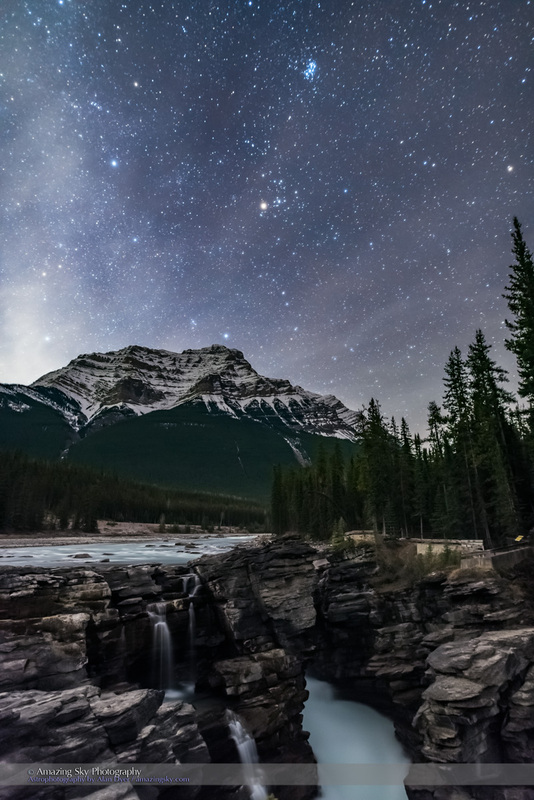 The autumn constellations of Perseus, Cassiopeia and Andromeda over Mount Kerkeslin at the Athabasca River Viewpoint on the Icefields Parkway, in Jasper National Park, Alberta. The Andromeda Galaxy is at upper right. The Pleiades are just clearing the mountain top at lower right. Thin clouds add the natural glows around the stars. Illumination is from starlight. This is a stack of 8 exposures, mean combined to smooth noise, for the ground and one exposure for the sky, all 25 seconds at f/2 with the Sigma 20mm lens and Nikon D750 at ISO 6400. Earlier in the night, I stopped at the Athabasca River Viewpoint and shot the autumn stars of Cassiopeia, Andromeda, and Perseus above Mt. Kerkeslin. The Pleiades are just appearing above the mountain ridge. 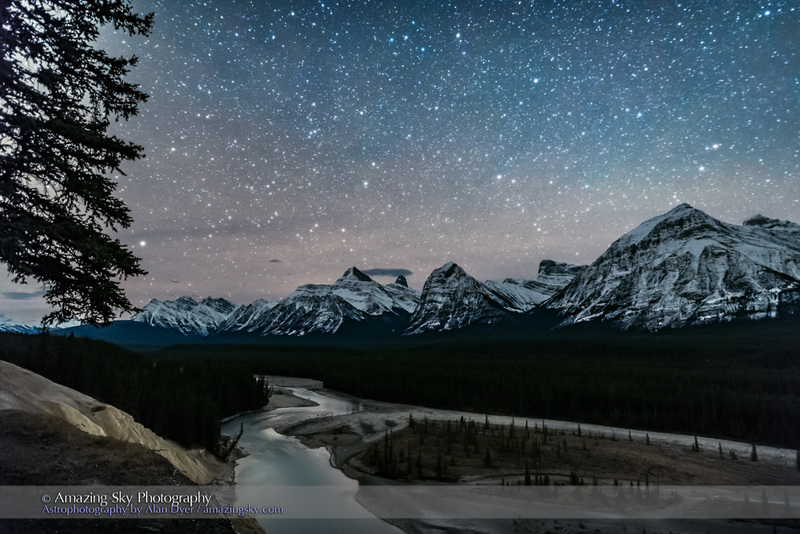 The autumn stars of the watery constellations of Capricornus, Aquarius, Piscis Austrinus, and Cetus over the Athabasca River and the peaks of the Continental Divide, from the Athabasca River Viewpoint (the “Goats and Glaciers” viewpoint) on the Icefields Parkway, Jasper National Park, Alberta. 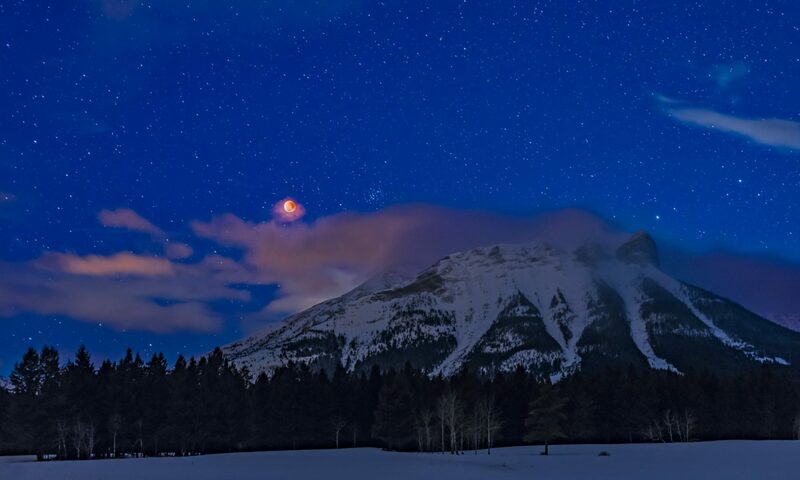 Thin cloud provides the natural glows around the stars. This is a stack of 8 exposures for the ground, mean combined to smooth noise, and one exposure for the sky, all 25 seconds at f/2 with the Sigma 20mm Art lens, and Nikon D750 at ISO 6400. From that viewpoint I shot a scene looking south over the river and with the stars of Capricornus and Aquarius above the Divide. The Milky Way over the region of Athabasca Pass, as seen from the highway viewpoint on the Icefields Parkway, in Jasper National Park, Alberta, Oct 22, 2016. 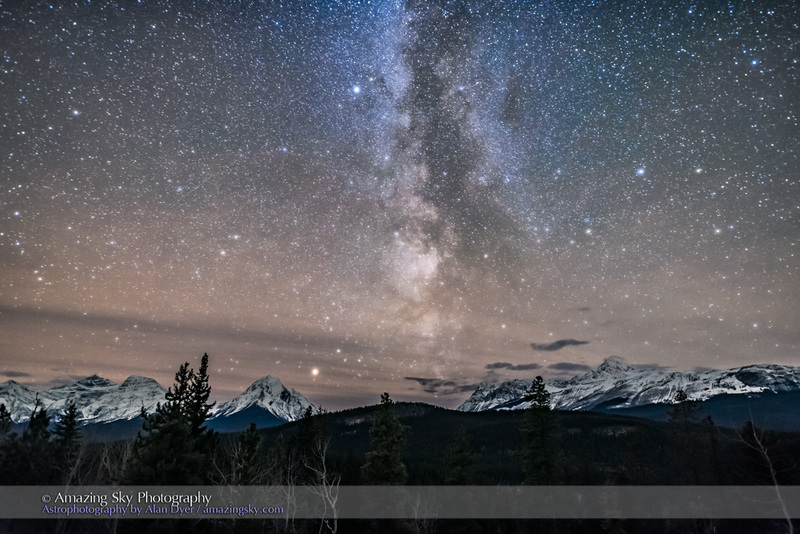 The Milky Way here is the section through Aquila, with Altair at top and Mars bright above the peaks of the Continental Divide. This is a stack of 8 exposures, mean combined to smooth noise, for the ground and one exposure for the sky, all 25 seconds at f/2 with the Sigma 20mm lens, and Nkion D750 at ISO 6400. The night ended with a display of Northern Lights over the Athabasca River. What a superb night under the stars in Jasper! The Northern Lights over the Athabasca River in Jasper National Park, Alberta, Canada, on October 22/23 at about 1:30 am. I shot this from an access point to the Athabasca River by the bridge on Highway 93 on the Icefields Parkway. Pyramid Mountain is at left near the town of Jasper. Vega is the bright star at left; the Big Dipper is at right. The image is a stack of 10 exposures for the ground, mean combined to smooth noise and to smooth the water, and one exposure for the sky and aurora. All 15 seconds at ISO 1600 at f2 with the Sigma 20mm lens and Nikon D750. As a finale, here’s a music video collecting together still images and time-lapse movies shot this night, and on two other nights during the Dark Sky Festival, including at the big Lake Annette “Beyond the Stars” star party I spoke at. As usual, enlarge to full screen and go to HD for the best view. Amazing work as always! 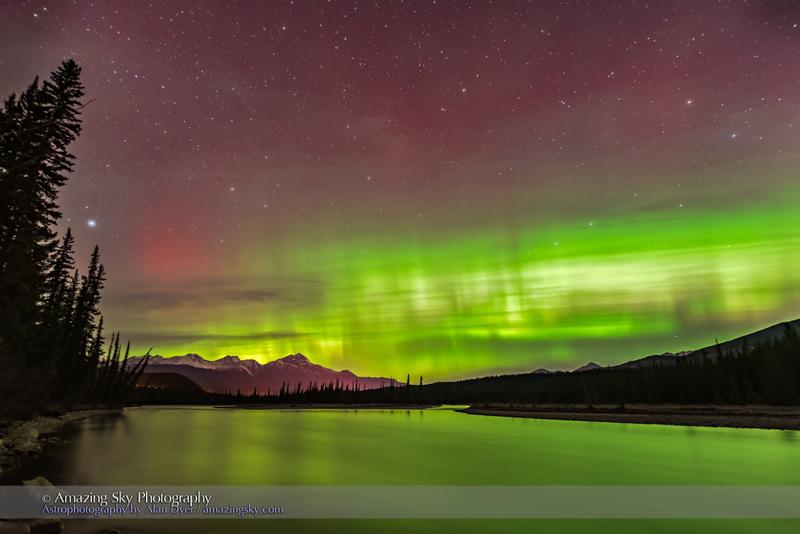 Perhaps next year we will make it to the Jasper Dark Sky Festival! Alan-I never get tired of viewing your spectacular photos. Thank you for sharing your special talents with us! Thanks! Hope you are getting great photos where you are. Clear skies! Previous PostPrevious Our Video Tutorials are Now Available!